Boulder Colonic Center | Boulder Colorado | What is a Colonic Enema? A colonic enema is low pressure >.5 psi, open, gravity-feed system and is similar to a home enema bag or colema board. The difference is; the location, having Mardell guide and comfort you, no set up, no cleanup, a disposable, non-reusable rectal nozzle, and perfectly clean water! A sophisticated enema table is used with Mardell cleaning & sanitizing the spa like room, filling the gravity feed tank, then disposing of waste and re-sanitizing the room after you are finished. Mardell is present to answer questions, help make your colonic enema experience as comfortable as possible. The process of being on the colonic enema table is your opportunity to experience the responsibility of feeling bowel pressure with the gentle >.5 psi water pressure, then actively push out stool, and repeat this process of fill-release over a course of 30-35 minutes in a quiet, private room. You remain in control of your process the entire session. The disposable rectal nozzle is smaller in diameter than a pencil (2.0mm) and is self-inserted 1″ beyond the rectal canal. 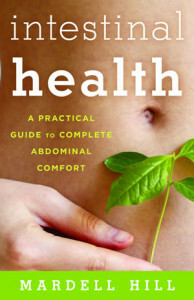 At any time during the colonic enema process, you can move backwards from the tank and end the session. Otherwise, as you continue the fill-release process, you are re-training or maintaining your colons (peristalsis muscle) to respond in a manner that is more conducive to regular bowel movements. Mardell is available to make you as comfortable as possible before, during, and after the service.